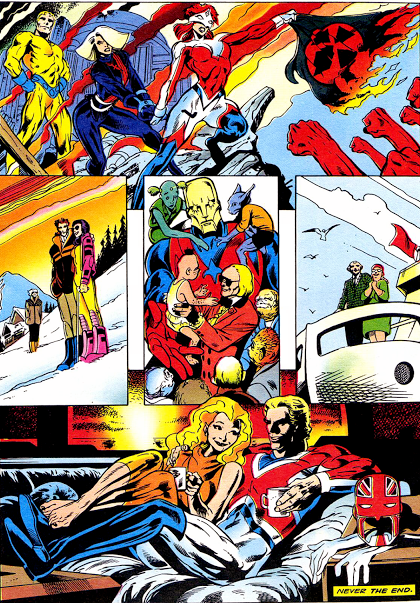 A Captain Britain seasonal story, ” Should Auld Acquaintance.” | The Captain Britain fans' page and blog. As Christmas gets ever closer I thought it would be interesting to look at a seasonal Captain Britain story, and a quick scan through my Captain Britain omnibus soon located the ideal festive frolic. 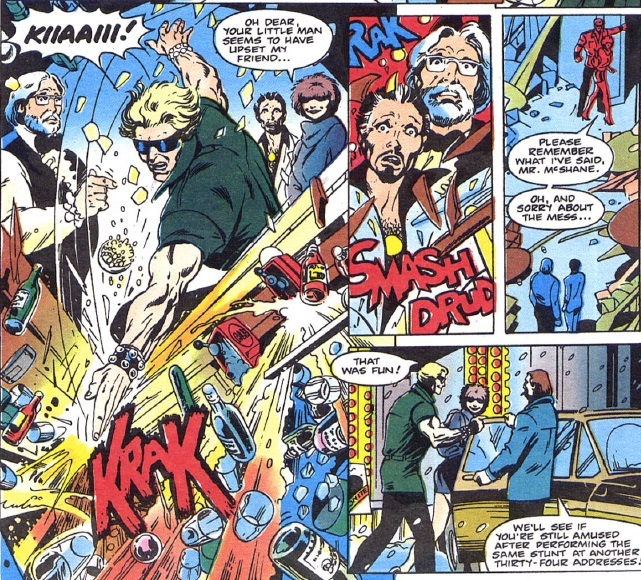 The tale in question is “Should Auld Acquaintance,” from Captain Britain issue 14 published in February 1986, Alan Davis handled the writing and art while Mark Farmer did the inks. Our Story opens on Christmas Eve as Captain Britain and Meggan relax in their lighthouse, however this being a comic book story nothing perfect lasts and their celebrations are interrupted by the arrival of their old nemesis Inspector Dai Thomas. Who was very lucky to make it judging by the weather. Rather than cause trouble – despite his claiming to know Captain Britain’s secret identity – Thomas has come to ask for help, it seems there have been a series of grisly murders of criminals in Glasgow, 27 in all, all carried out at speed with terrible mutilation. Ah there’s nothing to give you that joyful festive tingle like a few brutal murders, please stick with the story it does cheer up – eventually. Meanwhile Captain UK has just had her Christmas ruined by Roma who has told her that her presence on Captain Britain’s Earth is causing the birth of Warpies – deformed children with super powers. Captain UK must leave but she has nowhere to go as her home dimension and husband were destroyed by the Fury. Are you still not seeing the Christmas cheer? Please bear with me as this story gets darker before the happy ending comes. We move forward to Christmas Day and return to the lighthouse where at Thomas’ request Cap is pretending to be a mobster in the hope of luring the killer to him. His disguise leaves a lot to be desired, still you’ve got to love that hat. Luckily Meggan is a lot better at changing her appearance. Meanwhile at Cap’s old ancestral seat of Braddock Manor also home to the Warpies and his sister Betsy, supercomputer Mastermind disguised as a butler named Jeeves – don’t ask it’s a long story – is concerned. It seems Emma, the Braddock’s faithful maid is terminally ill, and Jeeves wishes to make her limited time a happy one and secure a bright future for the Warpies that doesn’t involve government control. Incidentally Emma is famous for saving Cap from Mastermind totally by accident, you can see that story here. Anyway back to the main plot Cap and Meggan arrive in Glasgow and proceed to smash-up the city and put fear into its underbelly in the hope of drawing the killer out. Back at Braddock Manor love is in the air for Betsy as despite her blindness her latent psychic powers are developing, and Jeeves has plans to take Emma away from it all while still safeguarding the Warpies. 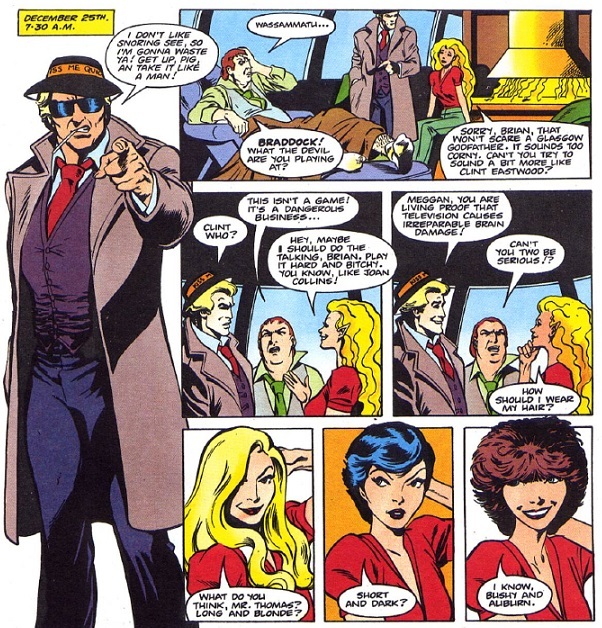 The story then shifts to New Years Eve as Cap, Meggan and Thomas believing they have drawn enough attention to lure the killer go on a stake out. While they wait old grievances are aired and cleared. This is a great page so well handled by Davis, a lot of mistakes between protagonists in comics are only solved by them beating the living hell out of each other. But not here, instead we have two rational people admit they made mistakes and become friends through this. Things are also looking up for Captain UK who finds Roma has for once used her time and mind manipulation powers for good to reset continuity, so Captain UK is reunited with her husband. This is a nice move on the part of Roma who along with her father Merlin has been responsible for a lot of grief for anybody putting on a Captain Britain uniform. Meanwhile at the stake out as midnight strikes the killer is revealed.That evil-looking face and slashing tentacles seem to me to be inspired by monsters from Japanese mythology, and as it attacks Davis leaves us in no doubt as to its powerful menace. Luckily Cap saves the day with a well-timed punch. Captain UK and her husband bring justice to their dimension, Betsy’s in love, the Warpies are well cared for, Emma enjoys the rest of her life and Cap and Meggan get some well-earned rest. That last panel leaves you with a warm glow doesn’t it, but just why is this story so continuity heavy and published late for the festive season it centers around? 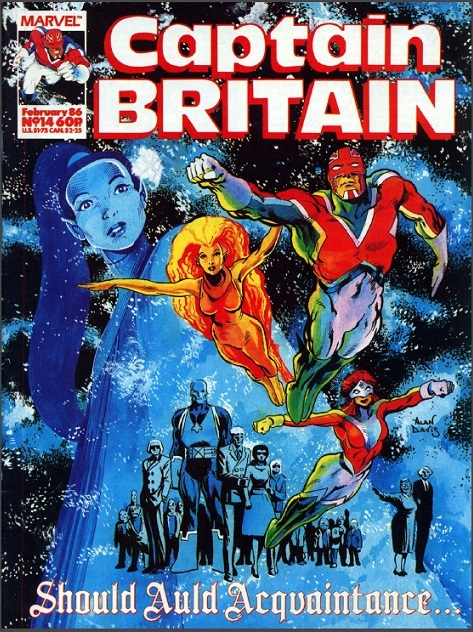 Well this story was to be Captain Britain’s last book with him as the main star until he joined Excalibur a year later – and that was a mixed bag of adventures – knowing so Davis has tried his best to tie up a lot of loose ends; some of which had been hanging around since Alan Moore was on the book. A nice touch is that the stories title and the seasonal setting give more meaning to the plot, and as we move from an old to a new year the characters move nicely from an old to a new life. The positions our heroes find themselves in seem logical, and it is a tribute to Davis story that nothing feels out of character or convoluted. As Davis pencils his own script the whole transition is lovingly rendered and his going solo as writer/artist is a foreshadowing of his excellent Excalibur run a few years later. You can keep up to date with all the Captain Britain news and views fit to print by liking The Captain Britain Blog on Facebook, or on Pinterest, or subscribe to this blog by entering your email in the link top right. Facebook followers not only get the regular posts but extra content I dredge from the site’s archives or I find as I trawl the internet. 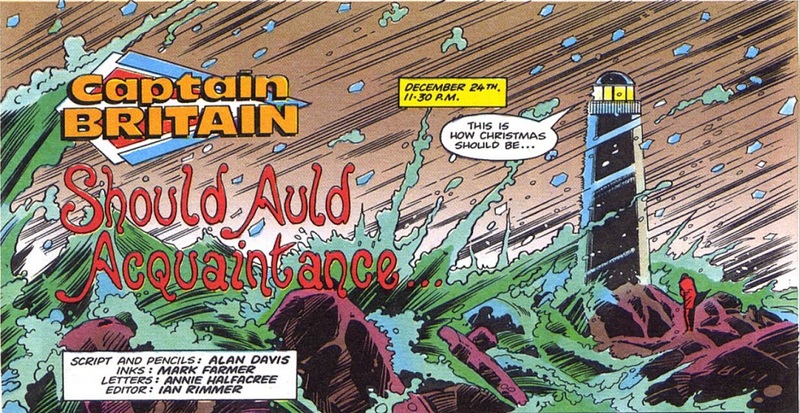 This entry was posted in Marvel UK, Modern Masters Alan Davis and tagged Captain Britain, captain Britain issue 14, Christmas, Marvel UK, New year, Should Auld Acquaintance by Richard. Bookmark the permalink. I never ever saw Captain Britain comics on sale in the 1980s so I can only wonder about how people actually came across these issues. I would definitely have wanted this had I seen it at the time, although 60p was a lot of money for a comic back then. I used to do my comic shopping at WH Smiths when I was at school in the eighties and I remember a lot of the Marvel black and white reprints but thinking back no Cap. I love the lighthouse as well but that rascal Alan Davis destroyed it in his Excalibur run. Beautifully illustrated and wonderfully written. 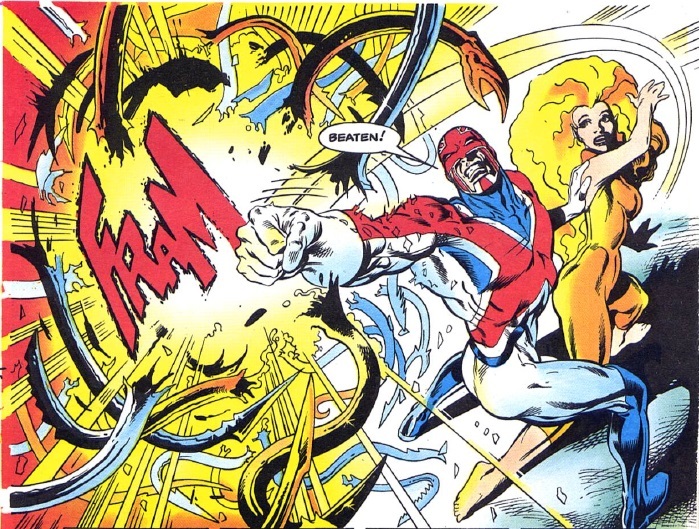 Captain Britain at his best. 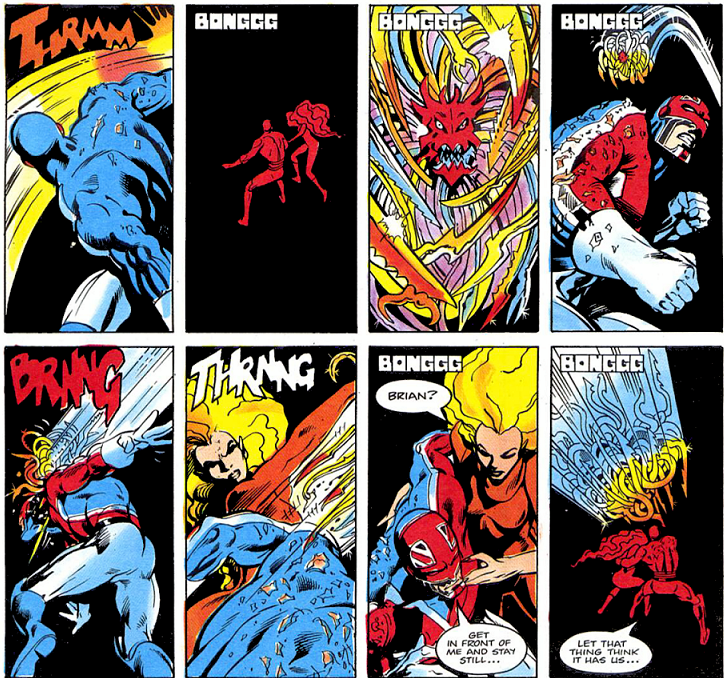 Alan Davis really is the ultimate writer/artist for Cap and his adventures. Marvel need to find a way to lure him back for at least a limited series to put Captain Britain at the top of the pile again, after so many other creators have messed him up. If you look at the end of Captain Britain and MI13 the ending is very sinilar with everything left quite nicely to be picked up later on freely.